The Villa del Golfo *** a few years ago the owners' residence, built in the early sixties by architect Marcello Zanca who has signed some of the most beautiful villas in the area, has recently undergone a restyling of the outdoor spaces , culminating with the construction of an infinity pool that overlooks the sea. Located in the district of Capo Zafferano on the homonymous chief, home to an old lighthouse still in operation, it enjoys a breathtaking view that extends to the promontory of Cefalù. From the villa the sea is easily accessible being able to choose between the cliff or a comfortable free beach, pebbles or if you prefer the convenience, you can access to payment at the Lido equipped. In the afternoon you can, with a romantic walk along the path of the lighthouse, admire the sunset, accompanied by the cries of the royal seagulls that populate the cliffs and, in spring, with their little ones that scurry among the rocks. From the villa it is possible, with a short walk, to reach some characteristic seaside villages such as Porticello, known for its fishing activity, S. Elia and Aspra with their Mediterranean colors and flavors and their joyous patronal festivals. Comfortable depandance separated from the main body of the villa, consisting of a living room with sofa bed suitable for a child up to 10 years of age, separated from the double room by a sliding wall. The depandance has a fully equipped kitchen but no washing machine and dishwasher, and a bathroom with shower. Bellissimisima villa, vista e piscina. Buenissimisima collazione. Padroni de casa molto accogliente. You can easily reach the sea by walk and enjoy snorkeling. The beach is on the rocks. Very nice and tasty restaurants are recommanded in the nearest little harbour Porticello. 12mins by car. The suite Il Uglivi is perfect, independant and have also a nice kitchen. Location 6 ou 7 étoiles , même si cela n'existe pas sur ce site. Nous étions les seuls hôtes ce début Juin, et les petits déjeuners face à la mer, avec un choix presque trop grand, la piscine fantastique partagée avec les mouettes, la suite Gli Ulivi à l'écart, très calme, propre et bien équippée, nous laissent un souvenir exceptionnel et nous donnent l'envie de revenir au plus vite. Endroit loin du bruit de la circulation, de la ville, avec un emplacement unique. Il ne faut pas vouloir trop charger les journées en excursions au loin, Cefalu ou Caccamo, sont du coté est, Erice-Segesta, Scopello de l'autre côté de Palerme, à l'ouest. A Porticello Santa Flavia deux restaurants à recommander : Al Faro Verde sur le port, et la pizzeria Antiqua Solunto sur les hauteurs. Merci à Maria et Aurélio pour leur accueil chaleureux et leurs conseils. Myself and my partner visited Maria and Aurelio's wonderful villa in the summer of 2015. It was a wonderful stay. 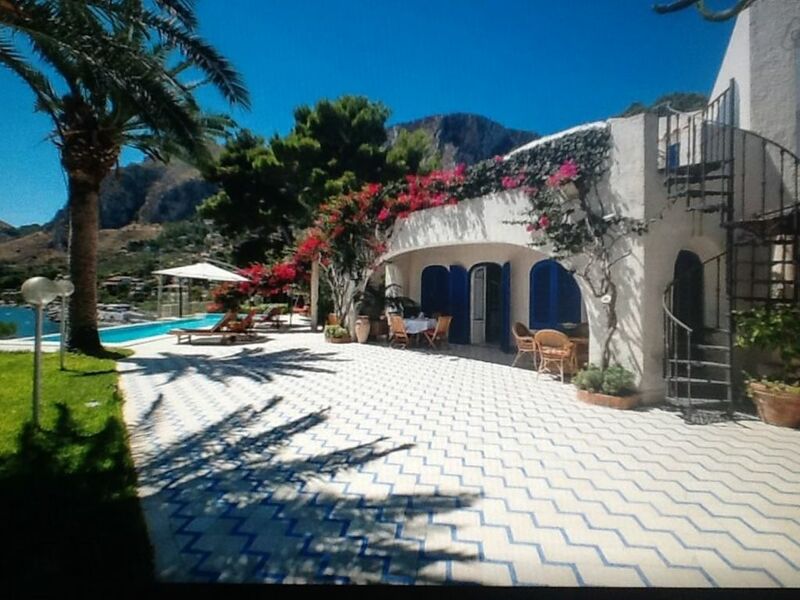 The villa does indeed match the beautiful pictures that are shown on the website. The welcome and hospitality of the owners is wonderful; they are very accommodating, happy to show you around the local area or provide BBQs. The surrounding area is very simple and perfect for any couple wanting some time to chill and enjoy. The beautiful little port town of Porticello is only a 20 minute walk away and has some excellent restaurants for a night out or bars and shops for in the day. A little further is Palermo or a trip into the heart of the Island (hire car recommended). One of the most wonderful things about this stay was the incredible breakfast; delivered every morning to suit, it was an incredible homemade spread that consisted of cooked and continental style food including some wonderful local delicacies. I would definitely recommend this accommodation for any couple wanting a simple, relaxing, rural get-away in northern Sicily. We will definitely be back! Nous avons passé un très agréable séjour dans un cadre paradisiaque. Les photos présentées sur le site correspondent tout à fait à la réalité. La villa est magnifique et offre une vue splendide depuis la terrasse et la piscine sur la baie. Le logement est impeccable et nous avons été chaleureusement acceuillis par Andréas (qui parle français ) et Aurélio ; Les propriétaires , tout en restant très discrets, sont aux petits soins avec les vacanciers qu'ils accueillent. L' endroit est de plus très calme, idéal pour se reposer. Nous recommandons vivement cette location !!! Dears we thanks for your sincere words that have really moved. For us it was a great pleasure to meet you, guests discreet, respectful of the property. Have you enjoyed all our attentions and you are always welcome at our house. We had a very pleasant stay in this wonderful villa and very nice family. The view from the pool on the see shore is gorgeous. Maria, Aurelio and Andrea have a great sense of hospitality. In addition, the location is very close to nice city to visit like Palermo and Cefalu. Maybe we will come back (who knows? ), but I will recommend this accomodation to my best friends and relations. I wish to this great family all the best for the future. you were kind hosts, discrete and friendly, thank you for your nice review. If you want to come back to us it will be our pleasure to welcome you as "special guests"!